In our clinic we daily witness cases of improperly treated somatic pathologies by different health practitioners. At this point we’ve accumulated enough material for a large book of clinical horrors that have developed from incorrectly formulated treatment strategies. Neurosurgeons, chiropractors, physical therapists and massage therapists have all contributed their share. The following is a recent case from our clinic which illustrates one of these unfortunate situations. This time it is massage therapist to blame. We had a patient who walked into the clinic today with all signs of being in great pain and distress. Two weeks ago, after lifting heavy pallets, he woke up with pain in the left neck and shoulder which radiated to the left arm all way to the 4 and 5 fingers. The patient went to a chiropractor twice without any results. Disappointed and in continued pain, the patient two days ago went to a massage therapistwho suggested he do cupping on his neck and shoulder, which he did for almost 30 minutes. Next morning the patient woke up with excruciating pain and now pain radiates down to the arm and makes his entire hand numb and burning. The soft tissues in the areas of cupping are swollen and extremely tender to touch, while his muscle fibers exhibit an uncontrollable twitch with even a light touch. There is a complete loss of touch sensation in the distribution of all three nerves which innervate the hand (radial, median, ulnar). 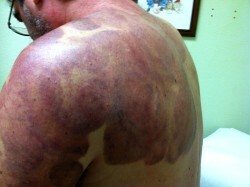 Before cupping, the patient felt sensory abnormalities only within distribution of the ulnar nerve. It was heart breaking to see a grown man practically crying from pain with every move, even a slightly deeper inhalation. The pictures below illustrates how the patient’s left arm and shoulder looked after a “cupping treatment.” Pay attention to the size of edema which made entire left shoulder swollen compared to the right side. Considering the absurdity of the situation and the intensity of the soft tissue trauma that had been done to the patient, we contacted the therapist and sent him these pictures. His response was that he is certified in cupping by one of the major educational sources on cupping in the USA and a picture like this one is the sometimes expected reaction and the patient will get better when the soft tissue recovers. Because of the severe soft tissue damage, we’re now forced to wait until at least some recovery occurs. The only treatment option at this point is opioids since nothing else was making the patient’s life even slightly tolerable. We will help the patient to recover, but until that time he will continue to suffer from the additional horrible pain which was unnecessarily inflicted by the therapist. 1. The patient clearly exhibited neurological symptoms. How can cupping on the shoulder and arm reduce the symptoms of sensory deficit along the distribution of the ulnar nerve? Apparently during national certification in cupping some “genius” actually taught the therapist to do that! 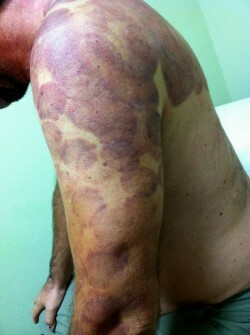 Will physicians who see this kind of treatment result forever write off massage therapy as part of medicine? 2. Certification in any modality means nothing if the practitioner continues to think by schema given to him or her during the seminar. Until the therapist stops trying to fit client/patient into his or her system of beliefs and rely on professional ego as only clinical judgment tool, cases like this one and many others we see in our clinic will happen regularly. 3. It doesn’t matter what cupping or seminars on other modalities tell you to do. Every modality has its own niche of application. For example, cupping has a very narrow niche while the niche for Neuromuscular Therapy is wider. However, they both work only within their own niches. The clinical solution is in the ability of therapists to combine tools to develop protocols which fit patients’ needs. This is the only correct way to practice the clinical aspects of massage therapy and it is the only way to become a massage clinician.